I've been busy doing a once-over on the existing rules, mostly to change all the tests from D6 to D10-based ones, as well as stripping out the "section" rules for un-openable buildings. Since they'll all just be impassible terrain now. I've also been making sure all the rules numbers are properly ordered. 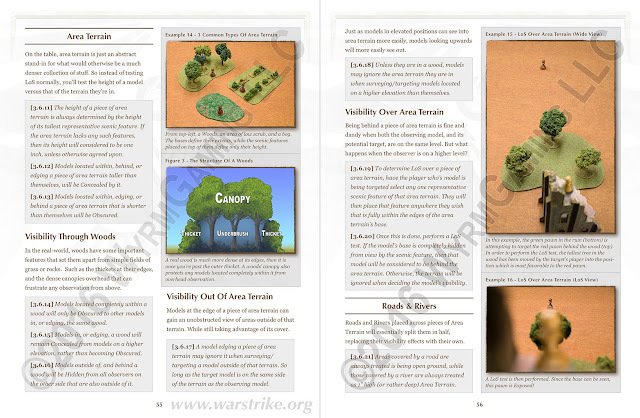 But all that editing did free up a bit of space to explicitly describe how Roads and Rivers interact with Area Terrain. It's not a huge thing, but it does clear up something that would have certainly prompted questions about how exactly they interact.